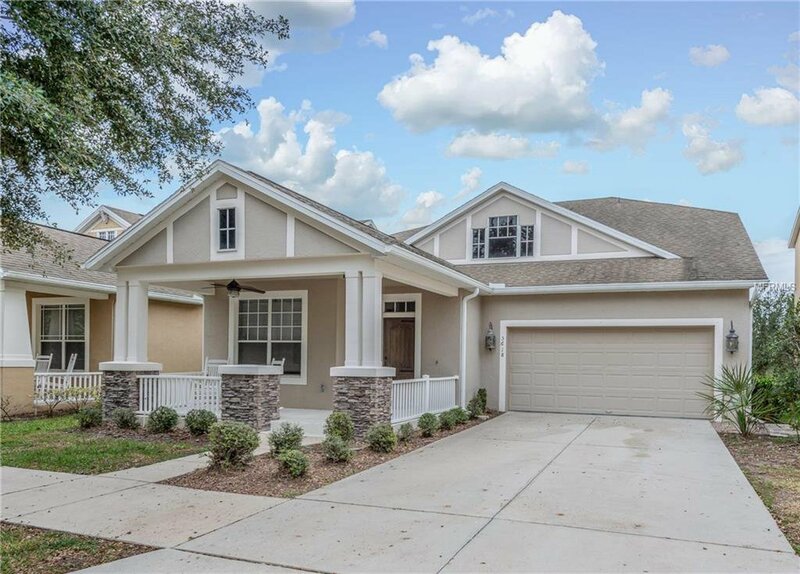 **WINDERMERE 4/3.5 POOL HOME** **FORMER MODEL** **CONSERVATION VIEWS -- NO REAR NEIGHBORS** **INTERIOR & EXTERIOR GAS FIREPLACE** **NO CARPET IN LIVING SPACES** Starting with great curb appeal including a large front porch with tudor & stone accents on a quiet street, this move-in ready Windermere pool home features CONSERVATION views & no rear neighbors! Fantastic & flexible floor plan with four large bedrooms, including master on main and "mini-master" suite upstairs, three full bathrooms & one half bath PLUS a large office with double french doors. OPEN LAYOUT with lots of natural light throughout. Upgraded flooring throughout office & all living spaces, upgraded cabinetry in kitchen & all bathrooms, newer stainless steel appliances & washer/dryer (ALL STAY! ), vaulted ceilings, crown molding, wood & iron open staircase banister and the grand centerpiece of the home...a floor-to-ceiling two-sided (touch-button start!) gas stone fireplace, providing ambience to both the large open living room AND the beautiful screened lanai & pool area! Fresh interior paint. Two newer HVAC units -- downstairs (2016) & upstairs (July 2018). Wired for surround sound throughout inside & out. AMAZING LOCATION - ZONED FOR A+ SCHOOLS including the brand new Windermere High School & WALKING DISTANCE to both Keene’s Crossing Elementary and Bridgewater Middle! Conveniently located to all shopping, dining & amenities...less than ONE MILE to the Summerport Publix plaza! Only 5.6 miles to Magic Kingdom. WELCOME HOME! Listing courtesy of TARA MOORE REAL ESTATE. Selling Office: INFINITY REALTY GROUP LLC. THE WELBERGEN TEAM - RE/MAX PROPERTIES SW. INC.